Reading and share top 12 famous quotes and sayings about Precious Memories by famous authors and people. 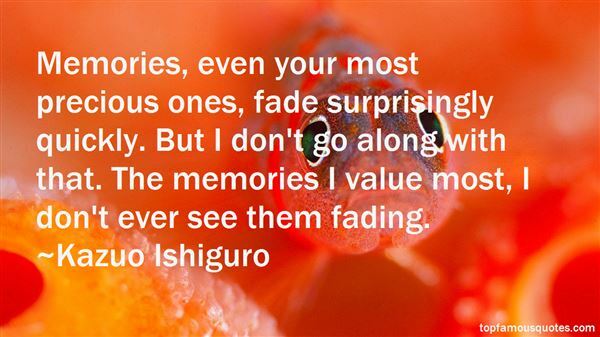 Browse top 12 famous quotes and sayings about Precious Memories by most favorite authors. 1. "Most uncomfortable situations brings at times most precious memories...."
2. "Regular maps have few surprises: their contour lines reveal where the Andes are, and are reasonably clear. More precious, though, are the unpublished maps we make ourselves, of our city, our place, our daily world, our life; those maps of our private world we use every day; here I was happy, in that place I left my coat behind after a party, that is where I met my love; I cried there once, I was heartsore; but felt better round the corner once I saw the hills of Fife across the Forth, things of that sort, our personal memories, that make the private tapestry of our lives." 3. "I can't over-emphasize how important an exquisite perfume is, to be wrapped and cradled in an enchanting scent upon your skin is a magic all on its own! The notes in that precious liquid will remind you that you love yourself and will tell other people that they ought to love you because you know that you're worth it. The love affair created by a good perfume between you and other people, you and nature, you and yourself, you and your memories and anticipations and hopes and dreams; it is all too beautiful a thing!" 4. "Indeed, precious memories may remain even of a bad home, if only the heart knows how to find what is precious." 5. "It is natural to want to forget, Anna, when everyday is a brimful of sadness. But those souls also forgot those that they had loved. You do not want that, surely? I have heard some preach that God wants us to forget the dead, but I cannot believe so. I think He gives us precious recollections so that we may not be parted entirely from those He has given us to love. You must cherish your memories of your babes, Anna, until you see them again in Heaven." 6. 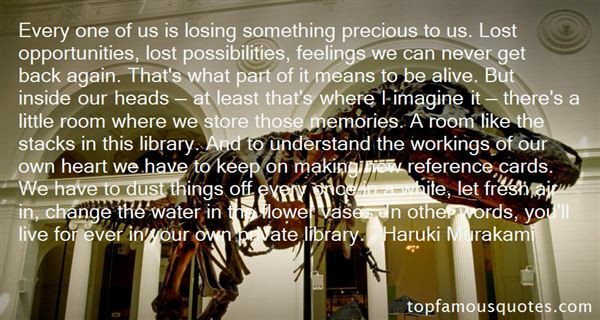 "Every one of us is losing something precious to us. Lost opportunities, lost possibilities, feelings we can never get back again. That's what part of it means to be alive. But inside our heads — at least that's where I imagine it — there's a little room where we store those memories. A room like the stacks in this library. And to understand the workings of our own heart we have to keep on making new reference cards. We have to dust things off every once in a while, let fresh air in, change the water in the flower vases. In other words, you'll live for ever in your own private library." 7. "If I were poet now, I would not resist the temptation to trace my life back through the delicate shadows of my childhood to the precious and sheltered sources of my earliest memories. But these possessions are far too dear and sacred for the person I now am to spoil for myself. All there is to say of my childhood is that it was good and happy. I was given the freedom to discover my own inclinations and talents, to fashion my inmost pleasures and sorrows myself and to regard the future not as an alien higher power but as the hope and product of my own strength." 8. "Novelty and Security: the security of novelty, the novelty of security. Always the full thing, the whole subject, the true subject, stood just behind the one you found yourself contemplating. The trick, but it wasn't a trick, was to take up at once the thing you saw and the reason you saw it as well; to always bite off more than you could chew, and then chew it. If it were self-indulgence for him to cut and polish his semiprecious memories, and yet seem like danger, like a struggle he was unfit for, then self-indulgence was a potent force, he must examine it, he must reckon with it." 9. "Memories, even your most precious ones, fade surprisingly quickly. But I don't go along with that. The memories I value most, I don't ever see them fading." 10. "For one perfect, precious moment, everything that ate at their sanity melted away into the shadows, and the crackling energy that arced between them was nothing but bright, sparkling memories of all their moments together in this car and all the things she'd let him teach her in it." 11. "Never forget,Each day that we have together is a precious gift.In the web of daily living, we are creating character.Let's take the time to create memories, listen and observe.Time flees, and it does not return.If we lose today, it is gone forever.Let's live for the present, and be prepared for the future. Let's grow strong, let's grow bigger, let's grow TOGETHER!" 12. "God bless you if you have one child, but I don't think anybody should have just one child. Everybody needs a sibling. I have siblings, and I have so many amazing, precious memories with my siblings. I don't know what I would do if I had been an only child." After all those days in the cotton fields, the dreams came true on a gold record on a piece of wood. It's in my den where I can look at it every day. I wear it out lookin' at it."